For years now I have shared my bed with a beast, although he used to be a prince and still was one when I met him and when we married. “How did it come to this?” I ask myself, querying the question. “And why won’t I leave?” To which there is no reply. These are but a handful of questions pulled from a list of intimidating length. The man behind the mask is still present inside and on good days he even comes out. The boy next door still lives on my road and when I visit, I can sit quietly in my car and watch him come out. In fact, if I am truthful – and I suppose I should be because this tale is more truth than fiction and honesty is the main point: I suppose he is around for half of my waking life. But the nature of that percentage is fragmented and split up and cannot be relied upon to present itself. One can be walking, working, socialising, shopping, etc…. and suddenly he –the beast, the demon – arrives, descending like a cloud to swallow everything else up. Then, the hand that I was holding is replaced by a paw, the eyes I was swimming in turn to ice, the voice that was whispering growls complaints and I am trodden on and trampled until I submit. It’s all rather pitiful and I am ashamed to say it out loud. But sometimes speaking difficult things is the bravest thing we can do and sharing can help others to avoid similar mistakes and, who knows: medicine can come from anywhere and take many forms; mine may arrive as a result of this. Anyhow, this is a cautionary tale and I implore you proceed with care: you never know when something inadvertently encountered is going to rise to trip you up. I’ve cried over poems and wept over books, made decisions based upon films. I’ve travelled far, experimented widely and challenged myself in ways I never imagined I would. I’ve admired, praised, loved; rejected, run towards and fled from. I’ve hidden, stolen, joked; lied, laughed and wept, etc… all inspired by creativity, in one form or another. It’s a powerful element and can do strange things – healing and hurting, helping and hindering, in equal measure. A fairytale in reverse, this is the story of a Cinderella deprived of a ceremony, a Rapunzel raped of her virginity, a Sleeping Beauty hooked on Prozac and a Snow White sold into slavery. It’s a child abandoned, a sister denied, a lover subjected to violence and a mother deprived. All very tragic. So how did it start and where are we now and why do we allow it to go on? And what went wrong and why did it happen and who’s really to blame? And do these things matter to anyone but me, when the result is just the same: unhappy, heartbroken, sick? I’m asking you to provide the answer because you are the only ones who can. We all have our own story, each one containing multiple chapters. Some of us live a new one each day, our pages turning rapidly, our words snappy and fast-paced. Others are slower to reveal themselves and are longer in length, appearing more like entire narratives, a book in themselves. At different times in our lives, their durations will vary. And, depending on what we are experiencing, so will their themes. Some will be romantic in nature, others more comedic, presenting as silly, carefree, frivolous and light. Others still will be tragic and sad, pensive and deep. We will reflect upon the passing of the years, the coming and going of people, who we are, who we were and who we have become. Despite being hard: it is never boring, for we never know what to expect. For some of us, the element of surprise is alarming and we suffer greatly as a result. For others, not knowing is liberating, allowing space in which to experiment and expand. Ideally, we fall somewhere in the centre, permitting what will be to be without attempting to block it or stand in its way. Love is equally as unpredictable and unreliable in nature. It comes and goes. It mutates. The quality rises and falls, often depending on external circumstances we lack the ability to control or predict. If we choose to indulge in this most human of experiences, seeking that perfect other half to complete our own gaping whole, then we risk falling and breaking. And if we decide to stick it out, believing still in spite of evidence that might suggest the opposite that things will improve, then we accept that the journey will be difficult. All this I have learned from experience. It is the hard way. But if we truly desire our happy ending, it may be the only one. OK, so it’s time to ‘fess-up and dish the dirt on all that I have been avoiding – and here I am talking about the things that I have been stepping around as if they were both odious and frightening: things that keep me awake, that play on repeat, that torture and torment me when they think that no one else is looking or listening in. Of course, there are many of these (and I have no doubt that you possess your own fair share of devious miscreants you would like to ignore or outrun) but I have decided ‘in the nature of taking things slowly so as not to scare the tiny bird of courage away’ to start with one: my newsletter. It is an issue that I have been evading, posting bits of writing as and when they come but neglecting to show you my actual art as it develops and progresses. There is a reluctance to be vulnerable, to expose myself to the thoughts, feelings, whimsies and opinions of other people, in case they don’t match up and hurt me. And it occurred to me the other day that this was actually rather sad and something I will come to regret. So, in a bid to reduce the measure of that remorse as and when it arrives, I have decided to begin at once and make a start. And while I might not feel ‘officially’ ready, because my website is still in progress: I am aware that it is going to be growing for quite some time, so I may never catch up. Besides, it’s about time I took my own advice. I am constantly gently pushing and encouraging others; I need to now take those steps myself. Why is it important to document and share? After all, it’s intensely personal, entails risk and presents you naked and vulnerable to the world on mass. And when you put it like that, it sounds positively scary: something to avoid at all costs. And yet, somehow, it’s not. From my point of view, documenting will be like building a time capsule; my newsletter serving as the all-important container. It will allow me to look back and remember and to observe both my evolution and my development along the way. It will illustrate the transition from blank to full, simultaneously revealing how each fresh piece came to life, gaining a story and a soul. And it will clear up the issue of just how long each one takes, resolving the mystery which has come to haunt me like a dinner-impatient dog, pestering the heels of my meticulous and details-oriented mind. From your perspective, on the other hand, which is arguably more important as you are the one reading this: it will hopefully unveil the particulars behind what I do, showing you how I go about it and thus encouraging similar imaginative forays and bold adventures on your side. I’m also hoping you will post pictures, sharing with me your achievements and your mistakes, and feel confident enough to put up your hand and ask when some extra help or advice is needed. We live in far too isolated a world and our separateness creates so many unnecessary problems within the smaller circle of our lives. It is important, therefore, to protect ourselves; to have a network – a sibling, a soulmate, a best friend, a mentor, an advisor, a therapist, a parent, a partner, a spouse, a much older and wiser someone to turn to when things don’t work out, when we are scared or alone, etc… And they don’t have to be related or real. I have people who fill those roles for me and they come in many shapes, sizes and guises. My dog is one of them, even if she isn’t technically a person. My grandmother too, despite having passed away. I speak to them both and always they reply, although I might have to be patient and open to the signs, willing to read beyond the obvious for the advice underneath. I hope that creatively I can be there for you, providing whatever you, in that moment, require. I also want to encourage creative confidence and growth in as many people as possible. It is my wish for everyone to have a tool to turn to when they need something solid and safe to hold on to, something they can rely on when everything else appears to have let them down: when the world is still afloat, still rushing by, but when they themselves are sinking. Below is a photo journal of my latest piece, featuring a flamingo. “Why a flamingo?” I hear you ask. “Well, flamingos are bright, bold and silly little birds and they remind me of summer.” Sometimes, that’s all the encouragement you need. Each time I begin a new piece, I start by selecting a colour palette. Looking to my emotions for assistance, I let my heart do the picking, trying to stay out of the way, going with my gut. If for some reason I feel guided towards colours that clash or combinations I usually dislike, I don’t resist: I unravel, wind and cut. It is important to me that the entire process is organic, that it comes from deep inside, from the place where my creativity lives and thrives. 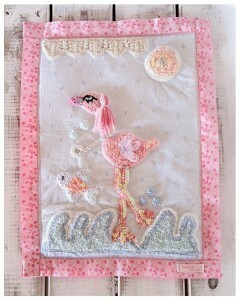 This piece was destined to be a flamingo; I knew this from the beginning, before I even put needle to thread. Some friends here on the island (Mallorca, if you are unfamiliar with my background) have just opened a boutique and, obsessed with flamingos, built their brand around the leggy redhead. 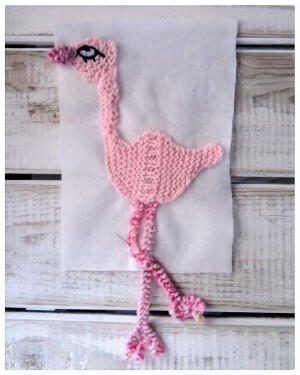 Never having written about, drawn, sewn or knitted a flamingo in any shape or form, I was curious as to the challenge it might present and intrigued to see how something I wouldn’t necessarily have selected might translate. 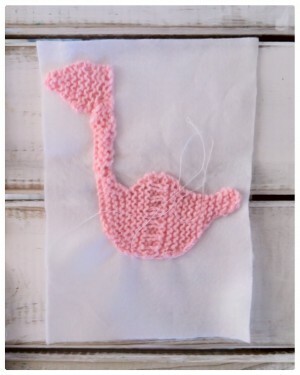 This is the bird as it came off my needles, before it really resembled anything: a strange pink shape with various bits sticking out, camel-like in appearance. At this point, I am unsure about it, undecided as to whether I like it and whether it is good enough to be kept. But, abiding by my own rules – those of going with the flow, allowing, keeping, refraining from condemning or counting as a mistake – I am determined to stand by it. To do otherwise, would be a betrayal of myself, breaking the bond I am trying so hard to forge. 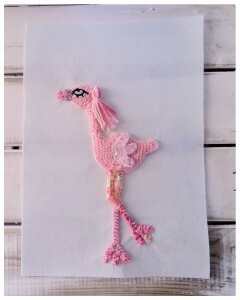 My flamingo is beginning to take shape, looking more and more like it should, developing a presence and a personality. It’s quirky and I like it. I have forgiven it for yesterday, when I was doubting the success of the venture and the ability of my hands. They know what they are doing and I should know better than to question the silent dialogue they share with my head. I may not be privy to the words or the message, but the physical statement is clear: when I allow, it usually works; when I interfere, it gets tangled up and eventually breaks. Standing back, trusting, waiting, listening to the stitches….. this is the way to proceed. So, what is there to report? 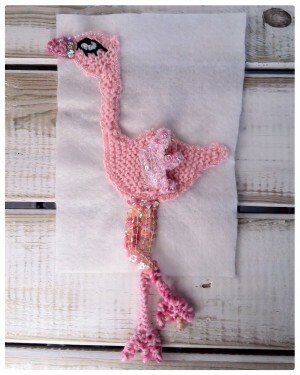 Well, first up my flamingo has an eye. It is pale blue in colour and matches the sky. 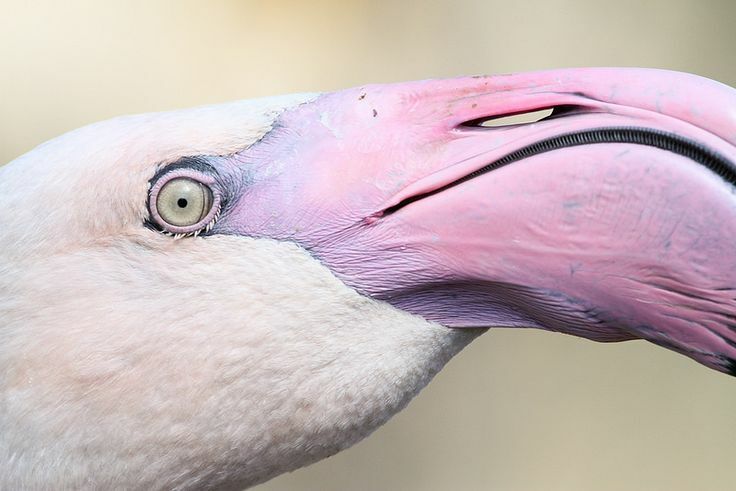 It’s not what an actual flamingo’s eye looks like (they are yellow and beady with pinprick pupils) but I liked this one better, lit has more warmth and depth. In reality, flamingos are a bit spooky; they give me the creeps. Next, comes the beak. 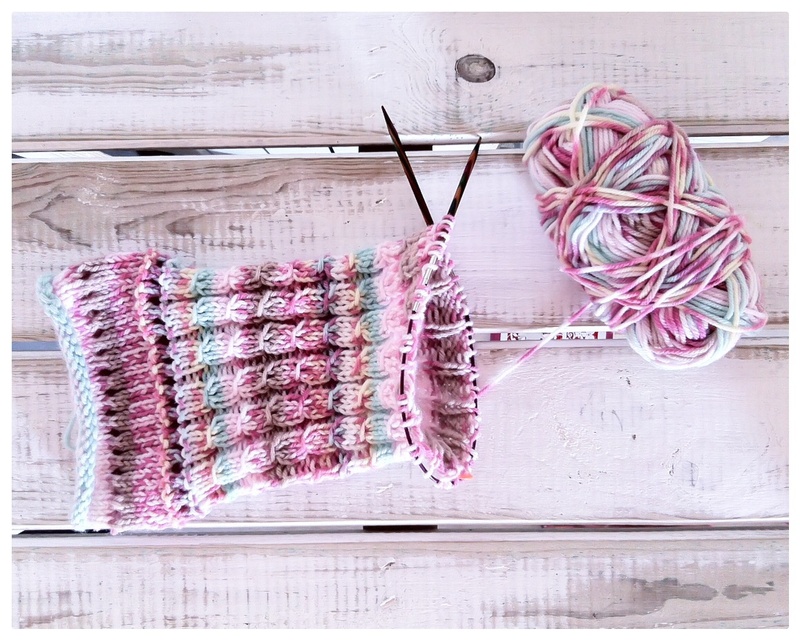 It is made out of variegated sock yarn, which means it changes in colour as you knit, creating a pattern – sometimes complex, sometimes simple. It is pink in colour. It looks a bit sinister at the moment. Dare I say a bit fallic? But I have faith that it will soften with the addition of some shiny bits. And finally, the legs: the pièce de résistance; for what is a flamingo without its legendary pins? – they are, after all, it’s most distinguishing feature. They need them to wade through deep water to get to the fish. And also to balance. What you think are their knees, are actually their ankles. Don’t believe me? Read this. Anyway, back to the point. 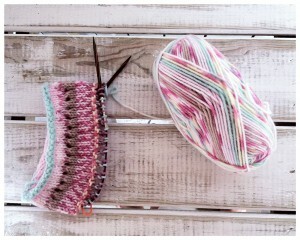 I used the same variegated sock yarn here as before and allowed the wool to dictate the colour. I think they worked out rather well, considering I made them up. At any rate, my camel now looks like a bird. This piece gets more exciting each day and I am enjoying watching it grow. As I add to it, I slowly warm to it and fall in love. This part of the process is vital: for without emotion, there is no creation; when I hate a piece, I find it almost impossible to work on it; like reading a boring book, it drags, every moment agony. Today I added beads and sequins, which, as you can imagine, took a long time. It also required a good deal of patience. But I find the process of accessorising quite therapeutic as it allows me to zone out, disappearing into my head. And my beak has redeemed itself, as I knew that it would. It’s almost crown-like in appearance: a tiara encrusted with jewels, making my flamingo look royal, a creature with a distinguished roots. Does that make me, its mother, blue-blooded too? Or is something bigger than me to credit for its aesthetic demeanour: the Universe, God, ancestral spirits, Mother Nature, elves, fairies, etc…? I spend the rest of the day adding to various parts, working slowly so as not to overdo it. I have a tendency to crowd a piece and I am trying to remedy this: pulling back, listening before responding, waiting for the inner message to emerge, giving myself up to the process. Next comes the wing, a vital accessory, necessary for both beauty and movement. After all: a bird without wings is like a spider without legs. Interestingly, the common assumption is that flamingos can’t fly. I, too, believed this. And why not? They look too big, too heavy. Their legs are too long. However, thanks to Google and an article on the anatomy of said bird, I have now been set straight. Flamingos do indeed fly, it’s just not a widely known fact because they mostly fly at night and we don’t see them. They also aren’t actually pink. Their colour varies, depending on the foot they eat. The more Beta Carotene, the deeper the pink. Conversely, flamingos that are white are malnourished and sick. So, if you see an alabaster flamingo, don’t just admire it, simultaneously documenting it and posting it on all of your social networks: take out your mobile and phone the R.S.P.A or your respective country’s equivalent. Otherwise, it might die. This wing took me several hours and is all I have to report. 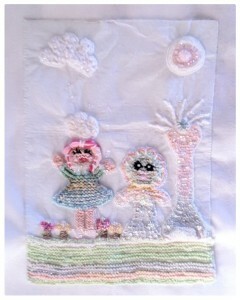 The rest of my time was spent on another piece, which contains a rainbow frog and a pink-haired fairy standing in a meadow underneath a cloudy moonlit sky. 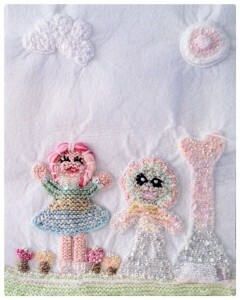 With a pastel palette and lots of beads and sequins, it is very colourful and shiny. Anyway, I think the wing worked, adding an element that was missing. It needed something to balance it out. So far it has been all head and leg. The wing makes it feel more complete, like a story with a middle as well as a beginning and an ending. Applying hair made me laugh. Technically, a flamingo doesn’t have any hair, but I wanted mine to have more character than the real thing and to be more fictional in nature. It’s like fairies: as far as one can prove, they don’t exist, but that doesn’t mean that they can’t or that I can’t choose to remain open to the possibility that they might. After all, who am I to say? Believing in Father Christmas got me presents; The Tooth Fairy, cash. And anyway, life is better that way: more mystical and less daunting. If one believes in fairies, then one can believe in fairy godmothers and magic and bad things going away. It’s the same with my flamingo: if she has wings, she can fly; if she has hair, she can look pretty and secure a prince, and, if I am lucky enough to meet her, even in my dreams, perhaps we can talk? After all: if she has one made up thing, there’s no reason why she can’t have others. 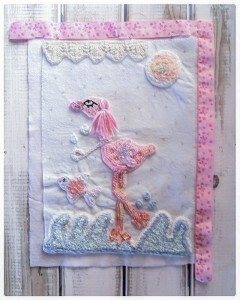 I also carefully cut around my flamingo with sharp scissors and stitched her onto a larger piece of felt. Now she is centre stage, ready for the rest of her narrative. Will it be day or night? Will the weather be foul or favourable? Where will she be: the beach, the city, the forest, a meadow, etc…? Will she have companions? If so, who? And what will be her underlying message? All of my pieces have a story to tell about something that is happening or has happened in my life, reflecting the events of the world around me and my own personal landscape. The longer you look at them, the more you see, picking out your own messages and writing your own script, their translation unique to each individual who comes to visit. Now for the finishing touches, at least to the bird. The background comes later and shall be documented differently, or else we shall be on this journey forever, you and I, and getting distracted. Not that it’s an unpleasant journey. It’s just that there are other things we should be getting on with and it doesn’t do to delay in one area since the rest then gets neglected. I have a frog and a princess to complete, a cabled iPad case to finish, a Kindle case to knit, a necklace to design, a cheer-up present for a friend to stitch and send off, and a pair of gloves to block. Added to that, there is writing and drawing. My hands are never idle and neither is my mind. The tail is another element added for aesthetic pleasure. It evens out the head and the wing, bringing the bird as a whole into balance with itself. It’s also rather fun and the more beads and sequins the better. I like their softening effect, the otherworldlyness they add to a piece. Looking at the bird now, I think she is finished. 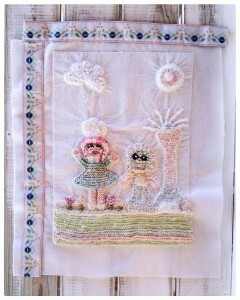 I will start to work on the rest of the piece and return to her later if compelled. From here on in, I shall document on a weekly basis. Most pieces taking two to three months to complete, that’s plenty of pictures and accompanying text. Any more, and you’ll have fallen asleep on me, drooling on your desk and ruining your paperwork. This is not, after all, a novella. Although you could be forgiven for thinking otherwise. The ribbon, in case you are wondering, is the one I have selected to border the piece: my version of a frame. I like the fact that is is bright and colourful, like my bird, and also that I haven’t used it yet. My choice may change later, but for now I think it fits. This week I French-knitted a moon and some waves to represent the sea and continental-styled a lace pattern to serve as clouds. Something new; something previously untested: I was interested to see if it would work. 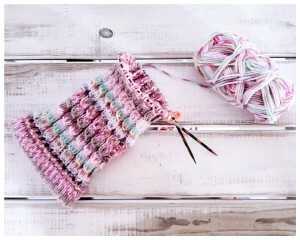 I have made fingerless gloves using this pattern (lots – I have a tendency to get addicted*) but nothing abstract, nothing entirely my own. So far, so good. I am pleased with its appearance on the fabric and will do a little more, perhaps down the top right-hand side of the piece to cushion the moon. The moon itself is made out of a Fairisle-effect yarn – faux-Fairisle to be precise, similar to the one I used for my iPad case. In fact, it may be the same ball. 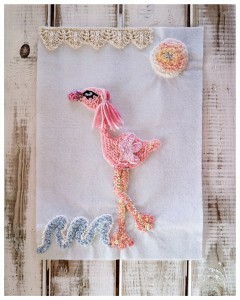 It’s a pretty pastel pattern and nicely represents a sunset in the Mediterranean. The sea, a baby blue in a hue that I adore – soft and delicate, warm rather than cold – is also new for me. I haven’t tried waves with water. Usually I just make it flat, a calm sea, undisturbed by life and nature. This time, I have curled it up and down and then added French knots (because I love them and like to let them exist at least once in every picture) just above to represent the froth; the white horses, so to speak. The yarn beneath the waves is a paler blue, with a fine metallic thread running through it: tricky to sew with but worth it for the effect. To me, it suggests magical things: the beauty that often lies hidden beneath the exterior, the wealth inherent within the subconscious mind, what we all conceal and entrap for fear of harm or pain. It also accommodates the unpredictability of nature, the chaotic dance of life; the constant movement each of us must endure, embracing or resisting, up to us. I know I wasn’t going to continue here, instead beginning and from there updating another post, a fresh one, but I decided in the name of simplicity to remain and to keep a tight rein on myself. In the future, it means everything is in one place, neat, tidy and ordered, which is the way I like to live my life. As you can see, I have begun to stitch in earnest – first attaching my flamingo scene to a plain piece of felt and then edging it with ribbon. It is a slow task, heavy on the eyes, and I proceed slowly limited by the available light. Evenings have begun to draw in. I have lost an hour of creative time and am fighting off the darkness at 8pm. By 9pm, I have lost the battle. All is black: blue a distant memory, white absent, save for the silvery moon, which shines intermittently. Although she too has been elsewhere lately, deserting me just as surely as my manmade substitute has. The hotel terrace where I currently work has sequestered my gerkin for alternative use and it now lights the tourists frequenting the outside BBQ as opposed to me. My flamingo and eyes morn its departure as deeply as if it were a close and long-held friend. I’ve had to wait for pity to descend in order to continue. Stitching without light is unwise, especially given the fate that befell my previous piece Wings and Webbed Feet. Once bitten: twice shy, so to speak. I am suitably humbled and chastised. Luckily, an unlikely benefactor came to my aid and I have been gifted a fresh light. The chef in charge of the BBQ, a man whose food I have never savoured and in passing only once spoken to, took pity on me, fearing for the health of my eyes, ordering the return of the one he took away. I think, in his bottle-top glasses, he learned the hard way and, in his kindness, sought to at least attempt to save me the same fate. Reunited, almost leant up against, fighting for space with the moths, I have stitched in earnest and managed to arrive at the end. 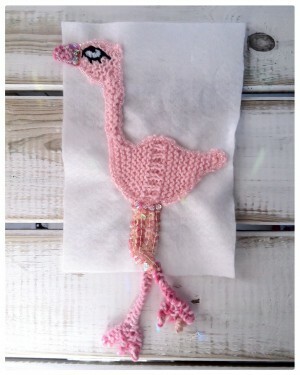 My flamingo is ready to fly, to go out and officially meet the world. I am happy with her, given that we have been on an eventful journey with many highs and lows: waiting several weeks for a new order of sequins to turn up, just one of them; others entailing hunting every haberdashery department and shop I could think of on the island in order to find five pale pink sequins for my fish who, although far from greedy in her requirements, managed to exhaust my existing supply. Because I often buy things on impulse, keeping them for that ‘special’ piece, not knowing exactly when I might need them or if I even will but sensing that I will appreciate the instinct and foresight one day, I regularly lose track of where they originated, sometimes even in terms of country. When this happens, it takes me a while to hunt them back down, or, in extreme circumstances, locate a substitute. Usually, bar the one incident where I lost through no fault of my own but the manufacturer discontinuing the line, I win, even if it means I have to go through Ebay or online shop clearance bins. Where there’s a will: there’s usually a way; and if not, the creative thinking that ensues eventually lands me somewhere far better than if the simple solution had applied. For this reason, I entrust my path to fate and the whimsical nature of the Greater Power up above. A long time ago, before either you or I were born; before, even, most of us can remember – not our mothers or our grandmothers, or their mothers and their grandmothers – there was a handsome prince. And, like many far-off fabled princes, he was spoilt and mean. He teased his sister, chased his maid, terrorised the kitchen staff, shouted at both of his parents; refused to attend school, whether home or otherwise, and spent most of his spare time (which, considering he rejected investing in anything that wasn’t directly relevant to him, was a lot) catching moths, dissecting butterflies, tormenting little kittens and stealing baby birds. His family, being good God-fearing people, suffered his behaviour to the best of their ability, attempting to instil their beliefs and values into him in the hope that, eventually, he would change. And for a while, they genuinely believed that he would. But as the years passed and he grew from a boy into a man, drawing ever closer to the time when he would, traditionally, inherit the kingdom: their concern grew, it’s toes extending into every corner. Fearing the destruction of everything they held dear: the community they had built, the people they worked hard to protect, the landscape that not only inspired artists but attracted writers from miles around, they called in external help, turning to the one person they knew they could rely on. And while her ways were initially painful, often confusing and unusually harsh, they accepted that they were also always right. So began a time of mourning, in which the kingdom wept a thousand tears and all who lived there learnt to pray for compassion and forgiveness. Years passed and nothing much happened: the king turned grey, the queen grew plump, the staff became less vigilant and the townsfolk gradually withdrew, for, although they knew it wasn’t their fault, they couldn’t help feeling responsible for the way that things had turned out. As for the prince: he grew into a man – bitter, twisted and resentful, all the worse for the feelings his punishment had evoked in him. Hiding inside the palace walls, he survived the comments, whispers, stares and judgement by keeping to himself. And then, one day, the king of Mercy arrived with his daughter, Grace, and the prince, who was now a frog, awoke, the beast inside him dissolving in an instant. Determined to win the hand of the beautiful princess, the not-quite-so-beautiful prince set about improving, first attending to his own (up until now) wicked ways, and then extending his efforts further into every attainable interior of the kingdom. Slowly, the chill began to melt. Life returned, laughter resumed and, once again, love remembered. And then a question was asked and a hole was created – inside of which, there existed everything. Having more than one piece on the go helps to keep me in motion, the pressure providing motivation that, in the heat of summer, it is otherwise hard to maintain. The inspiration for this piece is loosely based upon the tale of the Frog Prince, the title initiating a journey I then followed independently; the idea being that all little boys are smelly and nasty and mean to girls, pulling their hair and spitting at them until they grow into big strong men, who can – if kissed in the right way, by the right girl – turn into princes and later kings. I read vicariously as a child and was enchanted and entranced by mythology and folk law. I still am, especially the dark stuff. My favourite authors include: Aesop, The Brothers Grimm, Charles Perrault, Hans Christian Andersen, Giambattista Basile, Charlotte-Rose de Caumont de la Force, Gabrielle-Suzanne Barbot de Villeneuve… to name but a few. I also have a deep love for Enid Blyton, William Nicholson, J. K. Rowling, Philip Pullman, Terry Pratchett, Ursula LeGuinn, Angela Carter and Margaret Atwood. This narrative, mine, as pictured both above and below, depicts a frog and a fairy princess in a state of limbo: the frog deeply in love, desirous of the princess’s hand; the princess not quite so sure, for, while not terrifyingly ugly, the frog is a little garish with his rainbow dreadlocks and his feet that refuse the inside of shoes. Is matrimony to such a creature wise? And why does she have feelings for something so slippery and slimy anyway? Where did they come from? Her emotions unnerve her. 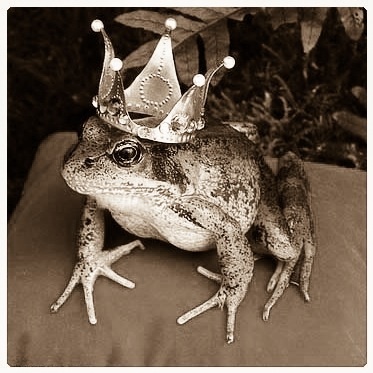 The working title for this piece is ‘The Frog Prince and The Fairy Princess’. But I don’t know if it’s right. If you have a flash of inspiration, a stroke of genius or a brilliant brainwave, let me know. 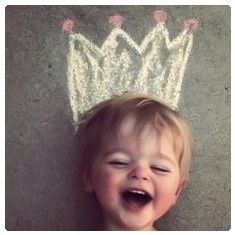 The top answer will be declared the winner and awarded a crown: one of my own; self-invented, hand-devised. Ok, so this is supposed to be the point at which I say: “Hurray. We are finished…”, pushing myself vertical to dance in public; twirling, euphoric; jumping up and spinning round and around. And I did, for a day. And then I came back and looked again – closer this time, inspecting for detail; searching for mistake, error – and it struck me, slowly, that something wasn’t right. Something was missing, felt off. As a whole, it was incomplete; the landscape, too white. So, as much as it pains me (and it does, because I have spent so long on this already: days, nights, etc. ), I have to go back and attend. I’m thinking some French knots around the edge of the inner canvas. 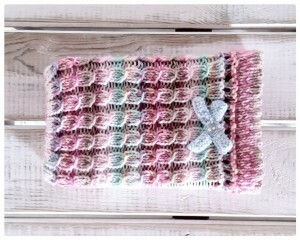 Or a thin knitted line – something to box it in, pin it down. Also, possibly some embroidered stars, or some beaded and sequinned ones? Or some knitted tendrils, like on my previous piece The Princess and the Pe-kinese and similar to those on the tree above? I will ponder it for a week and then decide. There is nothing but disaster to be gained from leaping. Less haste: more speed. I am praying in earnest to all of my stars, lucky or otherwise, that what transpires is what I need and that that will be the solution. It would be a shame, a tragedy, even, to be left with an unusable piece. If I don’t love it: I can’t sell it. Besides: if it looks less than great, it’s not like anyone else will want it either, unless they have a penchant for collecting lost and hopeless things, things that need rescuing. It’s probably something I would do. I collect broken things: objects, animals, people, plants. I cannot stand to see them standing alone, needing comfort, requiring aid, acceptance, compassion, forgiveness. It physically pains me. When I was a child, I could never part with my toys. I worried about their feelings, how they would fair. I couldn’t bear the thought of their pain at being thrown away or at being deemed unwanted. They had hearts, souls. They were alive. They got lonely if they got left, dismissed. Hurt if they fell or were dropped. It was a complicated job navigating all of them and still having room for me. I’m not sure I ever managed it. But I digress… Back to the art. That is, after all, what you are here for, what you are really interested in. My childhood, my past, my injuries and my neuroses: they are part of another world, one you can subscribe to if you so desire but one which I will not force upon you if not. Absence makes the heart grow stronger and distance provides perspective. After having stepped away for several weeks – focussing on other projects; concentrating on things that, kindly, were working in my favour – I have returned: doubly inspired, solution inhand. Like most things, it was actually relatively simple when it came down to it; the mistake, easy to remedy, not entirely of my hand. The culprit, the ribbon, was the wrong colour: too dark, too oriental, beige. It needed to be more subtle, not to compete so much with the piece; to compliment it, frame it, rather than dominating and weighing it down. I searched around in my ribbon drawer (yes, I actually have a whole drawer dedicated to housing ribbons… And, my goodness… I have so very many. I think I’m a little obsessed, acting like a squirrel preparing for winter lest my current shop of choice – and, I hasten to add, the only one available to me here – should close down, move away or sell out) and found the perfect design: delicate flowers (blue, orange and yellow) on a white background. Now all I have to do is carefully unpick the existing one so that I can sew this in its place. Having only just finished adding the ribbon edging to my pink flamingo, I am aware of the time involved, the concentration required and the damage such detail does to my eyes and, potentially, the piece. It is not a task I relish or approach with enthusiasm. But it is an important one, worth every bit of the pain for what it adds to the result. As I said above: absence makes the heart grow fonder. And it does, because, having removed the offending entity without consequence, I am thawing out again. The dominating ribbon, the ribbon that wants to overpower the piece – ruling me, my handiwork, my princess and my web-footed prince out of the picture and into the ether of non-existence and negative effect – is once again separate, sequestered to the relevant drawer. Now I just have to attach a fresh background of white felt and then add the new ribbon. I sense a series of long evenings. I have been straining my eyes on this one, racing against the setting sun, the following darkness. I have turned German too, if only in my antics, running out onto the hotel terrace where I work most evenings in a bid to secure my usual seat, the only one with light, before anyone else takes it. I’m not sure why, but the rest is unlit, bereft even of candles. It’s strange. Silly too. Do the management not realise how depressing it is to sit in the dark, struggling to see what colour your drink is, what your companions look like; unable, even, to read? Or do they presume we all have Kindles and iPads to accommodate our needs? But what if you are eating? This isn’t Dine in the Dark, no matter how much I would like that – just the once, if only to try it. It’s on my wish list after my brother did it in Singapore with his wife. It sounds like a laugh, even if you do end up with food all down your front and indigestion from eating goodness knows what. After three nights or roughly six hours, I have managed to attach a fresh piece of felt and two lengths of ribbon. Two down: two more to go. Or it should be, only there was a slight technical hitch yesterday afternoon leaving me to navigate a temporary delay. Well, there had to be, didn’t there, if only so that this piece could live up to its reputation of a noxious little beast. I blame it on the frog, I think he’s a little too fond, reluctant to leave the lap within which, nightly, he is lovingly caressed. And who can blame him? It’s a lovely lap, even if I do say so myself. I, too, would prefer it to the wall or a drawer; unless it happens to be your wall or your draw, in which case I would infinitely prefer it to my lap. Anyway, the hitch: I ran out of ribbon. 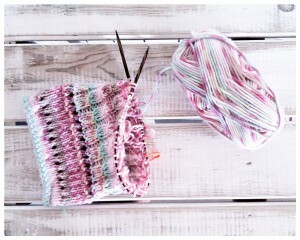 I must have used this pattern before and only begun with half the two metres I usually have at my disposal. I’m an idiot for not checking first. 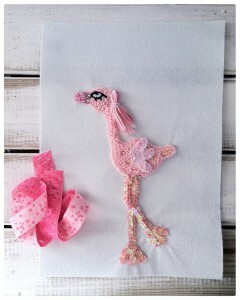 I was near the haberdashery shop only last week, buying sequins for my flamingo piece. I could have saved myself a long walk: up cobbled steps, down narrow streets, past hordes of tourists meandering lost in the mid-day heat. There’s a lesson to be learned if I can manage to remember it. Hopefully, I will catch the shop before it closes for lunch. They take four hours here and then stay open until late. It’s forever tripping me. It was the same in Australia (only with the ending, not the middle) where everything shut at 5pm. I got ousted from cafés all the time, left with two hours to kill before my ride home arrived. It was a pain. In the end, I usually ended up walking home, even if that took over an hour. At least it was action. It’s the hanging around that kills me. I hate delay. It’s the same right now with my future, which is all up in the air. I’m waiting to find out where, when and how, knowing only the why and the pressing urgency of it. In order to cope, I have devised a new motto. To find out what it is, click here. Finally, the ending: long-awaited and much-coveted. This piece has challenged my patience more than most. But it has also charmed and entertained me so I cannot chasten it. Besides, it was my first tentative foray into the landscape of ‘less than pretty’ and a complete experiment. 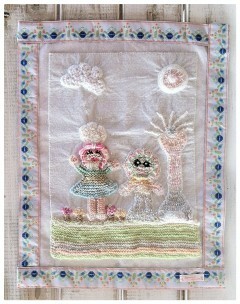 I have drawn uncertainty and darkness, unsightly and different, but I have never knitted or stitched it. It was time for a change, time for a challenge. In this sense, it was a success. Next up, I plan to attempt something a little different, going back to the knitted background and building up from there. And, perhaps, I will change the dimensions; try something circular or square? We shall see… After all, it’s not up to me in the end. My hands simply obey what is delivered from beyond. only smaller and many miles from the Thames. an hour from the capital. and if it has missed her? and which of them remember her when she did if they do? why she would want to? she has no idea how to solve? like family and friendship and love. passing through the belly of invisible clouds. It’s late and the sky is black. briefly drowning out the drone of crickets. The wind stirs, making several twigs snap. I forgot to clean up. acting on impulse, driven by instinct. I covet their simple lives. On the terrace, I watch the moon get swallowed and then spat out, passing through the belly of invisible clouds. It’s late and the sky is black. Overhead, a plane roars, briefly drowning out the drone of crickets. The wind stirs, making several twigs snap. Inside, ants surround the sink, descending on crumbs I forgot to clean up. Their perceptivity fascinates me, but I am tired of murdering tiny creatures. I do not understand this place – the moon, the crickets, the ants: acting on impulse, driven by instinct. Subject to the whim of emotion, ruled by my own dark tides: I covet their simple lives. Especially this one – as it’s creator, I’m allowed to say that. 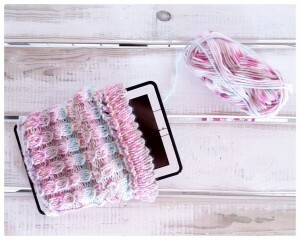 I was so enchanted with my iPad case, I felt compelled to make another one almost right away. So, after spending a few days on lacework for one of my pieces (clouds for my flamingo picture – the ‘fit bird’ in my life), I am back knitting in the round with my favourite faux-Fairisle. And what a jolly little ball it is, all pinks and blues with a dash of brown. Not having used this particular dye pattern before, I am intrigued as to how it will knit out. Two journeys in (remember, I am knitting in the car) and this is my progress. Casting on stitches with a chihuahua on your lap (yes, I am a total cliché, my dog never far from away from my knees) is somewhat challenging, especially when ‘said’ canine is reluctant to sit still. But we got there in the end and I managed to cast on, join and begin in earnest, to the tune of: click, click, click. What you can see above is the brim (think hat) or cuff (think jumper). Essentially ten rounds of knit, then a round of yo, k2, followed by another 10 k. The result, when folded and sewn down: a picot edge. Having used it before with hats and socks, it is familiar. It is also that little bit more interesting than a basic rib and rather pretty without being unnecessarily tiresome or complex. Sometimes one needs nice and simple; for the motion and the focus to be the purpose of the thing, its meditative rhythm, healing and calming, slowing the inner banter, quietening it. I have been working for a little over a week – my knitting time restricted, permitted only in certain locations and at certain hours: typically those bookmarking the morning. They amount to the too’s and fro’s of my life and, like retail therapy, provide valuable diversion; the only difference being that here the distraction is from commuters not change, the antagonists people in charge of cars. As I have advanced, the pattern hidden inside the wool has revealed itself. It is different to my expectations. I had anticipated something paler – more yellow and pink, less green and brown. I imagined it would be summery, in keeping with the current season. Instead, its palette reminds me of autumn, of gathered fruits and fallen leaves, of sweet and savoury sensory suggestions, a kitchen alive with cooking things, like chutney, jam and cakes. It rewinds me to a previous life, to a different year, to the crunch of dried things and early sunsets, to orange soaking the sky with the promise of a clear tomorrow, to the embrace of a familial landscape and the security of being young. I become nostalgic, lusting after a yesterday that I’m not sure ever was, craving a storybook illustration when the reality was somewhat more generic, mass-produced and black and white. My attention focused, I proceed quickly, secure within the pattern. Freed from my notes, I slip into trance, my thoughts drifting in and out, sinking down and under. I feel at peace, the journey no longer a source of antagonism. Each time we arrive (me and whoever is driving), whether at home or away, I am slightly disappointed, part of me longing to prolong my containment. This is a good sign. It means that the process is working, the piece filled with energy, intention and love. At the close of each journey, I measure the case against my Kindle to stop it from running wild. I am conscious that in my relaxed state it could easily grow ferrel, freedom enticing it to take the control from my hands. Finally, I reach the end, deciding to fold over and secure the open top before committing to the closed bottom. An extra line of security, so to speak, allowing me one last measurement before I swap my KnitPro Symfonie Circulars for a Clover “Chibi” Bent Tip. I fold the picot in half to create a seam. This gives the undulating edge, which always reminds me of castle battlements and medieval stonework. One of these days, I shall have to substitute the bow for a gargoyle to complete the effect. As an idea, it appeals, being somewhat quirky. I can now bind off with confidence, safe in the knowledge that I am knitting in accordance to rather than against; that, upon completion, I will not have to retrace my steps. Believe me when I tell you that casting off too early is devastating, being meticulous, painful, somewhat dangerous and repetitive. Besides, not one to endorse mistakes, holding to the belief that everything happens for a reason the exact way that it is, I would also be stuck with continuing, reinventing the purpose of the piece, item or garment in question, finding somewhere else for it to fit in amongst the plethora of things I wish to make. Sometimes successful, sometimes not: it is better with specific items to proceed slowly, holding back rather than getting carried away, even if that means ten minutes of travelling at speed on the motorway with nothing but the blur of passing cars and the straight line of the horizon (interrupted sporadically by farmsteads and tree clusters) to distract me. I find my Kindle and slip it inside the case, pulling the cuff right up to the top and then a little over, making sure it is both snug and comfortable, roomy but not oversized. It fits. I can now sew up the open end and declare it finished but for a bow, which I started making yesterday and plan to complete today. After some deliberation, I decided upon a pale blue for the bow. It went well against the colouring of the case, matching the palette within the pattern, drawing focus to it. In addition, it was more interesting than a pale or medium pink, there being a lot of that already and my having only just completed work on one of those for another piece. Besides, I like that it clashes slightly, the blue contrasting the green like two flavours of mint gum or a stripped toothpaste; they fit together, while simultaneously standing out: a bit like me and my personality. Casting on four stitches and using garter stitch, I knitted until I had achieved enough rows to tie the length created into a comfortable bow, testing it (you can see I like to do this: test, try out, make sure before committing; it’s something that expands into other areas of my life – sometimes aiding, sometimes hindering it) before casting off. I then decorated the bow with pearlescent beads, taking care to space them evenly – one above the other, three to a row. Done, pleased with the result, this was then stitched onto the front of the case using a technique called invisible stitching: the secret, matching the colour of the cotton to that of the wool, using small stitches and stitching neatly. Anything slapdash and it will show. If you would like a case of your own, please don’t hesitate to email me; I would be more than happy to make a few for the right people and price. There are easily six weeks of summer left to survive before the madness abates (see: I spy with my little i for an explanation) and I shall be clicking without interruption throughout. I’m also planning on making iPad, mini-iPad and iPhone cases, so keep your eyes open for these links to light up as I manifest my offspring. As with here, I will be documenting my progress throughout. Interested parties can sneak a peak, arouse their inspiration and pick up a few tips – like where to get wool and what wool to get, whether to use circular or dpn needles, which size works best, how long it all takes and ideas on how to accessorise once you are done. 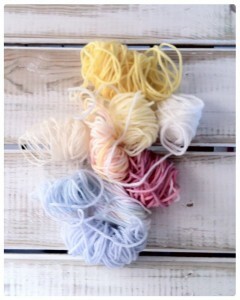 Below are images of the yarn that I used and links to where I brought it. 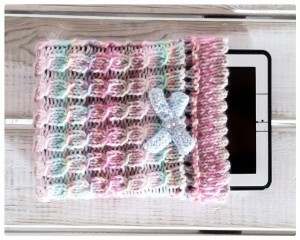 If you would like to make your own case or something similar (like a jumper or a scarf) you can easily order from here. I have to warn you though: they have discontinued the line, or at least this colour run, so stocks are running out. The same stands for those of you wishing to commission a replica. While I am more than happy for you to pick a ball from the site, I cannot guarantee I will be able to order it for you. It might perhaps be safer to order the desired ball on sight and then to have it posted on to me at my residence. That way, we all remain happy, our hearts achieving what they desire. I bought this yarn from woolwarehouse.co.uk. They are super-reliable, quick to act and prompt to dispatch and even post abroad at very little cost. That gives them five stars from me. What colours will you choose? So far, I have ordered one with my dog’s name (Bella) and one with my childhood cat’s (Fifi), for that reason alone. I also have a healthy collection of others and now possess over twenty different shades, although I have no idea which one is my favourite. I love them all, my preference shifting along with my intention and in line with my mood. A series of overcast days has reminded me how important the weather is, how much I value the sun; how deeply I loathe the winter, the accompanying cold and rain. With the decline, I’ve felt my mood plummet, matching the shift point for point. I cast my mind back over the past few months: the light, the heat – and forgive the intensity of it; even the nights when I couldn’t sleep, the mornings when the closeness of it was oppressive, hard to bear. Better that than this. Better that than me sat here shivering, struggling to warm up, cold in August) of all things. Claustrophobia descends, settling around my body like a dense cloud: a fog I cannot see through. Hiding in my room, I seek the comfort of literature, curling my mind into the words as I curl my body into a blanket. I sip ginger and camomile tea against a backdrop of white: walls that are still, even after over a year of living here inhabiting this space, waiting to be decorated; the reluctance to put down roots, to claim my territory, to settle – here, anywhere – is evident. I question my resistance, the reason for it, attempting to list the benefits. Footloose and fancy-free seem to have become my allies. Little and nothing my mantra. It’s all a bit too zen and a lot too modern. I’ve never been minimalistic. In England, my home was filled with personal effects; the space was a reflection of me. Fabric birds hung from painted ceilings. 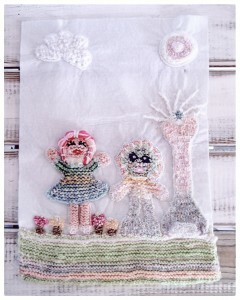 Paper butterflies clung to knitted plants. China ornaments talked to tin toys. Picture frames reclined in alcoves and rested on shelves. Books lined walls, creating temporary tables on polished floors. Paintings, mostly by me, although some by my friends, hung everywhere. I belonged there: it was my nest. Here, it’s more like someone else’s space, my being here borrowing. I decide that I need to make more of an effort and that I need to work harder on finding my happiness within. This becomes increasingly important as August disappears, each day passing bringing me closer to autumn and the start of everything closing and emptying, shutting down. The tourists will leave, the hotels will close, towns will turn into shells. Unlike other places: there is only life here for half of the year. I dislike that, the isolation that prevails. It is hard enough to navigate my own rocky terain, without also having to deal with the external. I wonder if there is anywhere in the world that suits me; if there is such a thing as an everyday sunshine place? No longer convinced; I still choose to believe. For to give up hope, to abandon the dream, is tantamount to giving up and abandoning everything: my writing, my art, my desire to be something more, my pursuit of the kind of happiness that resides inside myself. Tired of thinking, I let my eyes close and surrender myself to sleep. making a cushion out of me. my throat becomes a summer meadow. Arriving at the beginning, she feels frustrated. How many times has she travelled this way, circling the exact same landscape, weaving in and out of similar trees, meeting and greeting familiar people? Despite having lost count, she knows it is too many. Only a fool would keep repeating the same mistakes, failing to learn, not just from what has already been, but what has been and been despised. Feeling the twist of loss, she rushes cobbled pavements, ignoring the blade in her foot and the furnace that surrounds her, drawn on by the possibility that life will call her bluff and people surprise her. She knows her wish is futile, her hope naïve, but she continues to dream regardless. A romantic soul with a lonely heart, she always looks on the bright side, attributing to events the benefit. Only when it comes to the weather, which belongs to another being far greater than she, does she doubt. Dreaming is what she excels at, what spurs her on, what allows her to continue, even in the face of it. She arrives in a puddle of heat, immediately losing half of her dignity to the floor beneath her feet. The other half following, the moment she opens her mouth. An inconclusive reply in her mother tongue, a tongue different to that indigenous to here, further proving just how terrible her grasp of the language is; although she was understood, which must (surely) count for something. It does, doesn’t it? The important thing is that she tried and that she keeps on trying, like with her dreams. At some point the world will feel sorry for her and grant her her reward. She waits, her hands prostrate. The bathroom, the scene of the crime, is empty. Slowly, she peels open the door, steps inside, catches the light, disturbing a band of neon overhead. To her surprise, her heart’s desire is exactly where she left it, looking forlorn, face to the wall. She snatches it up, lifts it to her mouth, gently kisses it, welcoming it home; then presses it to her breast, where it fits exactly: the final piece of a complicated puzzle. Returning to the threefold space, a space functioning as entrance, centre and exit, too many jobs for anything so humble to do with any real success, her cheeks flushed, her eyes sparkling, her lips curved, she expresses her thanks. In the city centre, finding anything that has been left, forgotten or mislaid is unusual, unless that thing belongs to another and is part of their heart’s ache. She decides she must have a guardian angel after all and makes a note to correct her parents, who harbour more formal views. That means that God does exist, the Tooth Fairy is real, and elves can and often do live amongst the flowers and the plants at the bottom of the garden. Now isn’t that so much nicer than worshipping the shrine of insignificance, holding fast to the belief that we are all alone?